Even as U.S. military officials privately maintain there are no immediate plans for action against the Syrian regime, the American presence next door in Jordan is quietly growing as is an increased U.S. military capability to defend that nation. Defense Secretary Chuck Hagel's approval to keep a Patriot missile battery and a detachment of F-16s there indefinitely adds about 400 troops to the U.S. presence. While the units officially support U.S.-Jordanian military cooperation, they provide a real capability in a crisis. 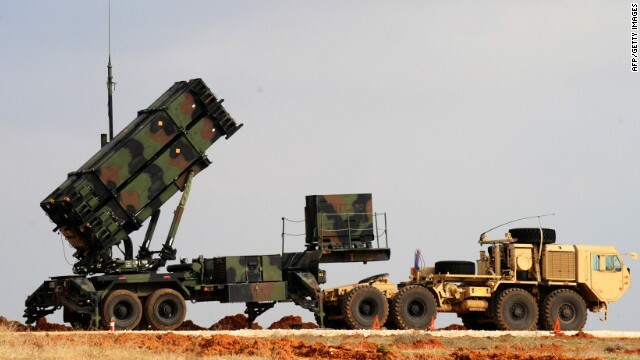 The Patriot battery would be used to defend Jordan against any missiles launched from Syria. The F-16s "send a message" to Syria, says one senior U.S. military official, that the United States will defend Jordan, if needed. Another 200 or so troops specializing in military planning from the 1st Armored Division's headquarters will arrive later this summer. They are to replace existing planners with a more focused ability to help Jordan's commanders prepare for any number of Syrian contingencies, including a chemical weapons crisis or a worsening refugee situation. The Navy also continues its longstanding deployment of three anti-ballistic missile ships is the eastern Mediterranean. The ships, with a total crew of about 1,000, carry Tomahawk cruise missiles to defend Israel from any attack by Iran. Several Navy officials say they could also readily defend Jordan or Israel against any Scud missile launch from Syria. The Marines are continuing a longstanding presence of about 130 personnel to train Jordanian units that are slated to go to Afghanistan. But that counter-terrorism training could be used in any crisis, officials acknowledge. All of the efforts were put into place before President Barack Obama said last week the United States had concluded the Syrian regime of President Bashar al-Assad had used chemical weapons against its people. Senior U.S. officials have said there is continuing concern that eventually some type of military units will be needed to go into Syria to take control of the weapons. For more than a year, the United States has quietly trained Jordanian forces for that mission. But the Army's 82nd Airborne Division is also training for that scenario. In a series of exercises at Fort Bragg, North Carolina, planned for next week, a brigade will train on how to be ready to deploy from the United States in 18 hours for a chemical weapons crisis. Although long planned, the exercise is aimed at what commanders see as a real world scenario, a division official says. At last Wednesday's White House meeting of senior national security officials, the question of whether to consider imposing a "no-fly" zone over Syria was again discussed, according to a military official who did not attend the meeting but was briefed about it. He said Gen. Martin Dempsey, chairman of the Joint Chiefs of Staff, continued to raise concerns about the need to be certain about clear objectives and complete understanding of the risks to pilots and the overall potential consequences of that action. Dempsey has warned that the notion of a limited "no-fly" zone would pose great risk to aircrews because of a sophisticated Syrian air defense system. With every two models released in the same metallic color, you can actually own both of the magenta . This article was from 2013! How different things are now. That whole area is completely messed up. We should never have pulled ALL our troops from Iraq! It's amazing how much things have changed in this region since this article was published. U.S. military presence in Jordan quietly grows, Not so quiet anymore. I was reading through some of your articles on this internet site and I believe this web site is real informative ! Keep on posting . I am upset these disputes are taking long to resolve in Syria. To me its been going on since the 80s. We cannot stand for ungoverned caios in the world. The American people and President Obama have a duty to protect the american people and our friends and allies. We do not want this war fuelling a new Jihad to the United States, like the Pentaagon bombing or the Twin towers bombing. It is important we take a stand, settle the dispute, end the war and have an American presence out there. We are for peace, and we should do all in our power to enforce it. The Jordanians or the Americans, as long as peace is sought and enforced, and the world knows what is going on at all times. We, the American people will be safe in our backyards. Will Obama require background checks from these Jordanians before giving them weapons? In case anyone is noticing Jordan is the only other arab country that attacked Israel back in '67, or so. Egypt? Gone. Syria? Going..going..
what will Israel do with all of this destabilized arab land?? hmmm...let us see...grab it of course, hook nose and all. the French? haha. they barely could take care of some sand farmers in Mali. Your elected representatives haven't found a conflict they didn't like. THIS IS THE CONSEQUENCE OF BEING AN UNINFORMED ELECTORATE. YOU WILL ULTIMATELY SURRENDER YOUR COUNTRY! You have the representation you so richly deserve! How so very true that rings, brown. Thank you. I couldn't have said it better! "your elected representatives haven't found a conflict they don't like"
take your pick of the many ignored conflicts in Africa and indeed this particular conflct that if your logic were to be true, we'd have entered years ago. We the people have been locked out of our government for a very long time. The Supreme Court sealed the deal completely with the Citizens United ruling (corporate money in politics). When a group of rich, arrogant people take the reigns – it doesn't matter which country- it becomes almost impossible to restore the government to a balanced and fair standing without violence. And because most normal people abhor the thought of violence we are kinda screwed...because the type drawn to power are almost always arrogant, self serving and shifty. I'm so sick of this country minding everybody's business. We should spend these resources on the people who should matter most to the government, their own citizens! Where does one find real news these days? Heheh I guess the Tabloid's. No disrespect intended. Just stop this middle east BS. I'm watching WWIII warming up in this country with public support not asked for or citizen notifications. Syria has done nothing to me. My government done me more harm then good. Why should I support a fight in Syria??? If the US Navy is there to defend israel, why are we subsidizing their military? Why does the United States always have to be the baby sitter? Could the Canadians or the French or the Italians for instance put their defensive weapons on the ground there. Where is the United Nations anyway. This is their job! You nailed it good, Greg. Why can't the French do this? In fact, if Obama's so adamant about getting rid of the Assad regime in Syria, all he has to do is to tell French Pres. Francois Hollande to do the job for him which can be done in three weeks without one American soldier or bullet! Besides, the French have already occupied Syria from 1919 to 1941!